There is a recent post up over at Tallbloke’s Talkshop: Thor Heyerdal: Retrospective on an Adventurous Anthropologist, which charts the man’s life and career on the occasion of the one hundredth anniversary of his birth: October, 6th 1914. The article at the Talkshop commented at some length on Heyerdal’s various ocean voyages to support his ideas about trans-cultural diffusion over very long ocean distances. Heyerdahl in particular inspired by his experiences in the south pacific in French Polynesia was possessed by the idea that the similarities between the famous moai figures of Easter Island and certain sculptures of pre-Columbian Peru indicated the possibility that vayagers from Peru encountered the native inhabitants and this was attested to in the oral legends of the islands inhabitants the Rapa Nui. Examining the possibility of a voyage by ancient Peruvians to Easter Island lead to the famous Kon-Tiki expedition in 1947. Another, similar, idea that possessed Heyerdahl was that the similarity between the pyramids of the ancient Egyptians and the Mayans indicated a possibility of a previously unrecognized trans-oceanic connection there as well. This lead to the various Ra expeditions between 1969 and 1970. I had a comment started which rapidly became too large to post there without blushing, so I posted a much abbreviated version there and the full length analysis below. Heyerdahl was a hugely determined and brave adventurer, a great man and a great inspiration, but not much of a scientist in my opinion. 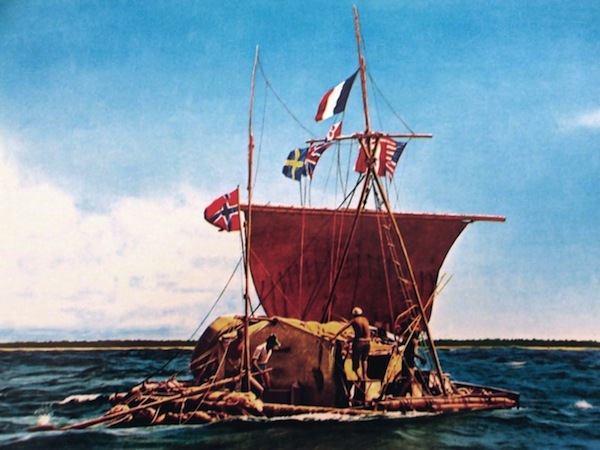 Heyerdahl certainly did prove that it was possible for a Norske to build a raft and to drift across two different oceans following the trade winds – knowing there is someplace to wind up and the possibility of a safe return via boat or aircraft – but not much else in my opinion. As for embarking on his later quest to effect the transformation the chief of the pantheon of your own culture’s archaic religion to a historical ruler/king somewhere in central Asia, a lot of other people besides Heyerdahl have fallen into that particular folly. The problem with Heyerdahl’s thinking, and which is pretty common even in academic anthropology and archeology is to mistake a morphological similarity due to parallel evolution with a line of decent – an easy mistake to make. An [absurd] example would be to conclude that humans and cephalopods have a recent common ancestor based upon a careful examination of the similarities of their eye anatomies, when in reality cephalopods, being a class of predatory mollusks, diverged from our hominid lineage 500-700 million years ago. You have to ignore a lot to reach a conclusion like Heyerdahl did. For instance, unlike the seafaring Norse who have been shown from an abundance of physical evidence as well as historical testimony [the Vinland Sagas & etc] to have crossed, recrossed and settled on the western shore of the Atlantic [despite the occasional fake rune stone found in Minnesota] and possessed an advanced enough sea faring technology to support the effort. Neither the Peruvians nor the Egyptians were particularly seafaring peoples. Phoneticians were, but certainly not the open sea – they were coasters. Another omission, the rafts Heyerdahl built were completely incapable of a return voyage. This begs the question of why the Peruvians or the Egyptians were sending rafts west when there was essentially zero chance of them returning east again. No theory of ancient trans-Atlantic trade really stands up to this. How would the people sending them know there was someplace to go, or even if there was a point in trying to find out? An early voyage Coast-wise around Africa? maybe, I’ll listen. But in the case of pre-Columbian trans-oceanic contact you would expect some significant records on the departure side of the ocean as well as the arrival beachhead. Columbus at least believed he had a reasonable chance of making it all the way around [maybe foolishly] or making it back. One could argue that Peruvian shamen and Egyptian priests were in communication with the entity who inhabits the psilocybin molecule, who simply told them what was there, but again, lack of evidence – though people have tried to link the dynastic Egyptians with psilocybin use none have succeeded convincingly. A final omission by Hyerdahl is the overlooking of the technology which he very well knew did work – the Polynesians and their proas. It takes a lot to overlook something that exists and works. The Polynesians had a long and successful history of navigating vast distances across the pacific planting colonies in their wake and had the sea faring technology to support the effort. We know the Polynesians successfully populated virtually the entire Pacific basin as far east as Hawaii and west as far as Madagascar and were generally able to get where they wanted to go, at least on a seasonal basis. Heyerdahl and his crew, however, arrived in Raoria, five guys on a wrecked raft. This doesn’t seem much basis for a wave of conquest from the continent that would go onto errect hudreds of stone statues in honor of their deified ancestors and challenge the native population. While it may be within the realm of possibility that some group of hapless Peruvian sailors on their raft were cast away and washed up on Easter Island and managed to leave a genetic marker behind, it seem so much more likely that there was some contamination in the genetic record in recent centuries. Parallel evolution is a huge problem that is only now really getting its proper attention. Evolutionary biology, at the moment, has the huge task before it of resorting everything it sorted out in the last two hundred years, now that it has the tools required to sort organisms into genetic lineages other than by morphological similarities. I pity the poor ornithologist who now have the task of resorting the 5,000 species of passerine birds ahead of them – job security I guess. Of course the ignoring of obvious similarities in found throughout nature and history can also cut against the improvement of knowledge, like ignoring the seeming perfect fit between South America and Africa and dismissing it as ‘coincidence’ as I wrote not to long ago in Science Eats Her Young. The key is to have the right tests and the ability to recognize the underlying omissions and assumptions of a theory that points towards its eventual failure. Plate tectonic theory? wonderful, but still needs some work. The pre-Plate tectonic theories on the other hand now read like something you might come up with if you’d been hitting the mushrooms a little too hard yourself. Sometimes its hard to tell which is which; however, an honest appraisal of the state of knowledge among geologists about the workings of the interior of the planet prior to 1960 should have been, ‘about zero’, thus geologists should have been a little more open minded to continental drift, despite the fact none of them were clever enough to imagine a dynamic system capable of shuffling continents. An honest appraisal of the technology of a balsa or reed raft: it will drift with wind and tide aided slightly by a sail until it rots and falls apart in the tropics. Hyerdahl and others seem to have more or less proven this point. No possibility of return with this technology unless you can trek far enough north to fashion a new raft and catch the Westerlies back towards somewhere in northern Europe. No evidence for this, or the triangular trade route it implies. The westerlies in the southern hemisphere, by the way, pick up so far down the coast of South America, that you’d probably miss the bottom of Africa and keep on going into the Roaring Forties – bad luck on a raft. Even today not too many sailors try to challenge the Saint Helena High and slog directly from S. America to Africa. Personally, I just don’t see what the problem is with the notion that two distinct peoples can independently come up with a similar idea for tasteless monumental architecture. If Leibnitz and Newton can independently come up with the calculus within months of each other why can’t the Egyptians and Mayans both discover the pyramid? If you are an early civilization a pyramid of some sort is probably the second thing you are going to try if you have labor and time on your hands – after tilting up stone slabs. I am actually very interested in experimental anthropology and archeology as a process and adjunct to science, it certainly can put proper constraints around what is possible, practical, or likely, but can’t do much, by itself, to establish lineage or causality. It can also shed some real light on the processes that tend to drive parallel evolution. Some techniques simply work better than others given a particular state of technology what ever side of the ocean a culture may happen to reside. For instance, I have a cousin who has a hobby in recreating medieval Norse attire. The men of science suggested for years the ladies’ costume with its distinctive brooches was worn a certain way. The first modern woman who came along and tried to actually *wear* the outfit that way reported. ‘No, ridiculous, when I go to breastfeed my baby the brooch pins tend to poke my baby in the face. No mother would put up with this for half a minute.’ Score one for practical science. It’s not that I’m against these diffusionist types of theories in general, its just a matter how much evidence there is and how much sense it makes. It is becoming increasing clear that long distance trade is one of the distinguishing characteristics of Humans apart from other Hominids. For instance, I think there is reasonable cultural and anthropological reason to think that there was at one time a tenuous and intermittent trade route of some sort clear around the arctic from Finland to Canada. Peru to Easter Island? Egypt to the Yucatan?- probably not. Personally I would like to see some effort put into investigating Phonetician involvement in the Cornish tin trade; the bronze that built Rome was made with Cornish tin they say. There’s lots of evidence for an ancient tin trade network to Cornwall, digging around in old pits and comparing isotope ratios in classical bronze alloys & etc, but not much work done that I know of in establishing how it was actually conducted. Probably worth investigating. We’ll see. I see that I’ve probably said too much. This entry was posted in Evolution, Science, Uncategorized and tagged diffusionist, experimental anthropology, Kon-Tiki, moai, parallel evolution, Ra, Thor Heyerdahl by w.w.wygart. Bookmark the permalink.